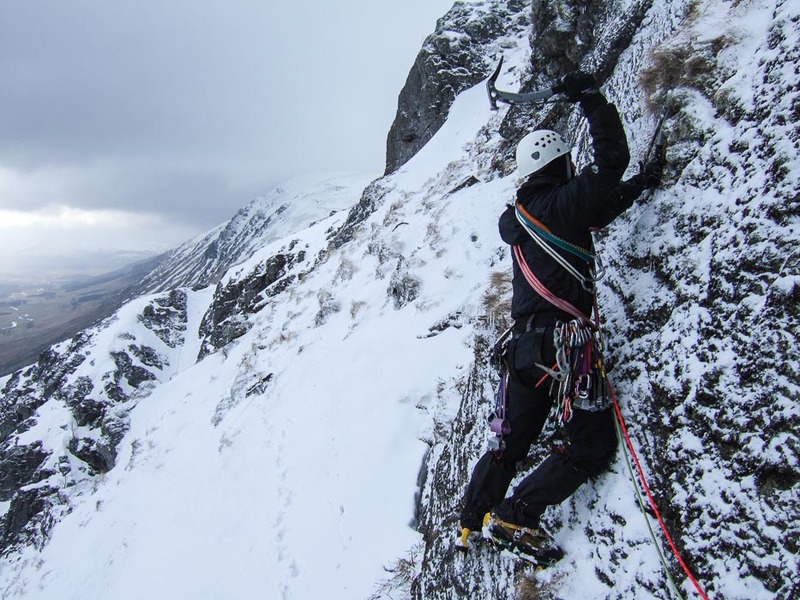 Forrest Templeton, Kevin Murphy and Matt Smith added an excellent three-pitch mixed route to the north-facing cliffs of The Scorrie in Glen Clova on March 31. “After yet another beastly easterly, I reckoned it may be worth a punt returning to Clova to have a go at a wee line I had been eyeing up,” Forrest Templeton told me. “So last Saturday, Kevin, Matt and I headed up the Glens. Our objective was high up on the Scorrie so we parked at the car park and followed the Scorrie path. It did seem cold enough and sure enough, as we got higher the snow hardened as did the turf. Dropping down from the obvious boulder on the ridge we passed below the start of One Man Gastric Band/Scorrie Romp and contoured round the toe of the buttress and belayed below an inset rectangular slab leading up to a capping roofed corner. This was pitch one and was climbed on small turfy protrusions with the occasional torque, crossing a small overlap about half way and a small tree to belay in the obvious corner. Pitch two constituted the crux and involved a series of underclings on sketchy footholds moving rightwards to reach awkwardly into a turfy groove for axe placements. The corner-groove was followed past another welcoming and more substantial tree over small overlaps to reach the Gastric Band just below an attractive right angled left-facing slabby corner where a commodious and comfortable belay can be arranged. The third pitch was started on the left side of the slab and followed more turfy protrusions interspersed with some good cracks until a move right into the corner can be made about two-thirds of the way up. Above the difficulties a belay on a large detached block was reached, which lies almost directly between where the Scorrie Romp and One Man Gastric Band converge. From here we followed easier ground to the Scorrie cairn. This entry was posted in New Routes and tagged Forrest Templeton, Glen Clova, Kevin Murphy, Matt Smith. Bookmark the permalink.